One of our favorite new products was a labor of love not just on our end, but with another team of makers that we’ve long loved and admired. The Sercy Studio is a company dedicated to selling little “sercies” that spark joy and can be passed along for generations. We love their mission, and we thought that it paired well with the goal of Breath of Inspiration line. So we thought, why not collaborate? Now, we have our mini Breath of Inspiration notecards, in beautiful packs, paired with a sercy. We’re so happy with how this turned out and loved working with The Sercy Studio. Read on to check out our conversation with MacKenzie Williams, the heart and brains behind the company. Breathless Paper Co: Tell us a little about the story and progression of The Sercy Studio and its mission. MacKenzie: The Sercy Studio is a dream come true, but it didn’t happen overnight. After my first daughter was born, I decided not to return to my design job at a local architecture firm. But I knew I wanted to work! At the same time, my aunt was sick and received prayer beads. I loved the gesture and thought it could be expanded into a gift line. My aunt Ruth also used the term “sercy” to describe a little gift given for no reason except love. I created my own version of beads and eventually called them “blessing beads”. It was perfect because I have always been crafty, and I got to put my Fine Arts degree to use! Seven years later, The Sercy Studio has evolved and become much larger than I could have ever imagined. We sell blessing beads and other sercies online and in over 300 retailers across the country. M: Creating blessing beads for special occasions and milestones that people want to remember! BPC: How long have you known Jess / BPC? M: Gosh, 5 years? Jess and Matt were so kind to help me take my first professional photos. I was new to wholesaling and Jess helped me get off the ground! BPC: How did this collaboration with BPC come about? M: We have lots of time to create and collaborate mart week! Jess's encouraging cards sets were the perfect compliment to our little sercies. BPC: Describe to us a little bit about the line you designed with BPC and why your brands align. M: We hope the card sets and tokens make people smile! The cards have encouraging words and the token are a sweet addition. I know several people that keep the box in their purse and hand them out when they encounter someone that may need a sercy. BPC: What do you hope this collaboration accomplishes and provides for customers? M: I hope our card packs make it easy for our customers to be thoughtful and show love to others. BPC: A large part of BPC's mission is to promote the importance of handwritten notes / love notes and sending real mail -- what is your personal opinion on the importance of this? M: I have a whole cabinet at my house with stationary, cards and tags for me and my kids. I totally believe in the power of a handwritten letter! I am a gift giver but no gift would be complete without a handwritten note. And on the flip side, I think it is important to show appreciation when I receive a gift. BPC: Anything else you want us to know? M: I feel blessed to know Jessica and Matt. They are an inspiring couple that has been encouraging to me on my entrepreneurial journey. Posted on April 14, 2019 by matthew berinato and tagged collaboration the sercy studio breath of inspiration breathless breathless paper co encouragement gifts gift idea blessing beads inspiration cards gift sets Stationery paper goods paper company nashville atlanta. SPRING IS HERE! Finally. We have some serious spring fever. As Easter and Summer approach, we’re excited to be outside more with friends and family. 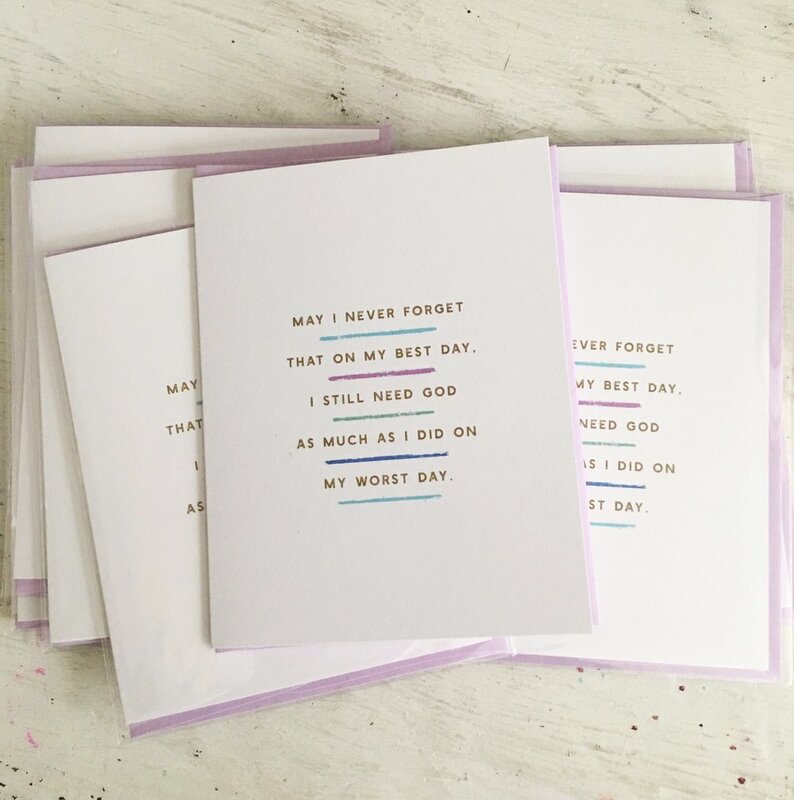 We chose this Card of the Month because it’s one of our newest additions to our Breath of Inspiration line, and it’s the perfect expression of the Easter season, and a reminder of the importance of taking the good with the bad. Wishing a happy spring and a peaceful Easter season to you and yours, from Breathless Paper Co.
Posted on March 31, 2019 by matthew berinato. December is HERE! Winter has almost completely taken over, and there’s no denying that we’re deep into the holiday season. So, we naturally had to pick one of our new holiday cards for this month’s Card of the Month. This card from our new collection with artist Angela Elliot is perfect for expressing all that the holiday brings — joy, craziness and humor. This season is about telling those you love how important they are to you, and spending time with the most important people in your life. If you’re looking for last minute card orders, shop our retail shop or send us an email! Happy Holidays from ours, to yours. Posted on December 3, 2018 by matthew berinato and tagged card of the month december breathless breathless paper co craft paper paper goods craft paper goods. If you know us, you know that we’re all about writing and sending notes and letters. It’s important to remind those around you how much they mean to you. Plus, giving love brings love back to you. It’s a cycle that costs nothing to participate in. Around the holidays, it’s especially important. The holidays bring love, but also stress. By telling others how much they mean to us, we can dissolve some of that stress and emphasize the love. We’re making it easy for you by sharing some of our favorite holiday card picks. Grab some for your family, friends, holiday hosts, neighbors, even strangers. Love is love. Posted on November 16, 2018 by matthew berinato and tagged love notes holidays holiday cards holiday 2018 holiday gift ideas breathless paper co breathless paper goods paper company nashville small business. This past weekend, the Breathless Paper Co. family went to Chattanooga for rest, relaxation and family time. And, of course, lots of cute boutiques and paper goods. Read on to hear about our trip and our Chattanooga recommendations — the food, the sights, the kiddos, the paper. On recommendation from our friend Mariah from Shadowbox Paperie, we stayed at the new Westin Chattanooga, and it was beautiful! It's in a super walkable location, which is especially nice in the Chattanooga fall. After arriving on Friday, we had to get room service because our kids think it’s just the best. We were in vacation mode, so we got up later than usual on Saturday and had breakfast at Tupelo Honey in Warehouse Row. That area is designed by the same folks who created Ponce City Market in Atlanta — so it’s pretty awesome. Afterwards, I was so excited to get to finally go to Shadowbox Paperie. Mariah has been a customer for years and years, and the shop is hands down one of the best paper shops I have been in. I fell in love (and walked out with a few things, of course). Then, I dropped Matt and the kids at the (totally awesome) Children's Discovery Museum so I could go check out all the shops we work with and a few others suggested to me: Sophie’s, Charlotte’s Web, Seed, Blue Skies, Genevieve Bond and Furnish. First, I went to Sophie's and… I want it ALL. They have bought from us for years and I hadn’t visited in so long. And let me tell you, I didn't want to leave. From the product mix to the way things are merchandised, this place was amazing. Then I popped into Charlotte’s Web. They do monogramming and carry a bunch of our napkins. It's the perfect shop to get a special personalized gift! I headed to the Riverfront to see Seed — it's called the '“happy shop.” And it's filled with happiness! They just started carrying some of our cards so it was fun to pop in. I stopped into Blue Skies, and I've been told I had to go in there. It's filled with all kinds of great gifts and paper. I think our Heartward line is absolutely perfect for this adorable shop! After going all around downtown and the surrounding spots, I headed further out and went to Genevieve Bond. She carries a lot of our cards and our Heartward tees. It's a very large packed full of awesome goods shop. Everything you'd want for a gift, it’s there! Then, I went to Furnish — which is a perfect farmhouse shop! I was so excited that they carry Heirloomed so I had to make the trip there. It was so worth it. It has the most wonderful feel (and smells so good). After going to as many shops as i could, I picked up my guys and we got ready for a fun family date night — our favorite. We walked from the hotel to Old Gilman Grill which was delicious and had an adorable atmosphere. Our kids love getting dressed up! After brunch and the aquarium on Sunday, we headed home. It was so great to spend some time away with our kiddos and Matt. Plus — we love seeing our products in action. As usual, thanks for all the support. We couldn’t do it without you guys and all the shops that show us love. Posted on October 28, 2018 by matthew berinato and tagged breathless paper co breathless breathless paper heartward heartward goods kids clothing kids apparel children's clothes accessories paper goods craft paper greeting cards family business shop small small business family time chattanooga. It’s the season of collabs! We worked with Atlanta company and friend, Ashley Edmonds of Beer Greetings, on an awesome “Happy Hangover” 6-pack holder and some fabulously festive cocktail napkins. Perfect for craft beer (or wine!) lovers. And just in time for the holidays. We’re obsessed, and we think you will be too. BPC: How long have you been in the "Beer Greetings" business? We launched Beer Greetings in time for Holiday 2014 with just one design to test the Market. BPC: Tell us a little about the scope of what you do and how the business has grown. Beer Greetings is a part of our broader company, Smartsy Brands, which strives to provide innovative solutions to everyday problems - big or small, silly or serious. Our products and brands are all born from needs we see in our own personal lives with lots of input from our customers, family and friends. It started with our eco-friendly gift wrap line, Lilywrap, and then expanded to others including Beer Greetings. I love the process of taking an idea for a brand new product and guiding it through the development process all the way to launching on store shelves. It's a very surreal, exhilarating (and sometimes frustrating) process. 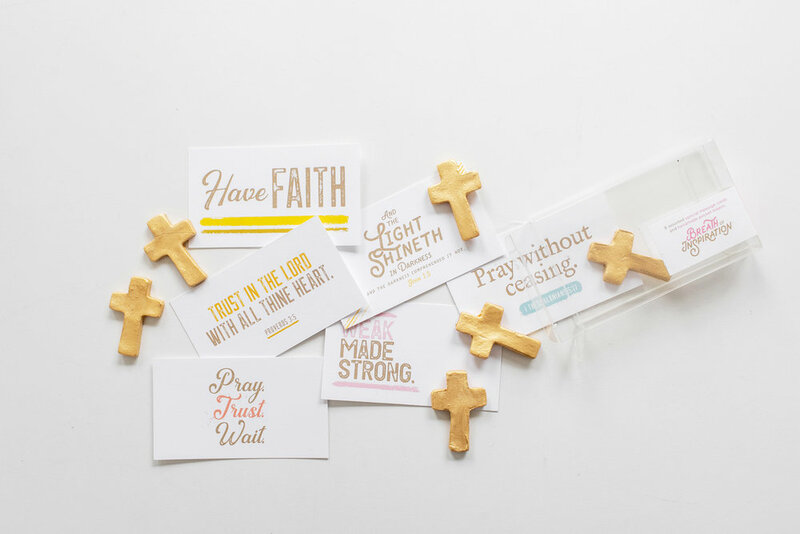 BPC: How did you begin working with Breathless Paper Co. (BPC)? BPC: Describe to us a little bit about the line of 6-pack holders, etc, that you designed with BPC. I love the witty humor of Breathless Paper Co. So when working on joint six-pack carrier, we knew it had to be funny and perhaps a bit edgier than our standard boxes. I basically told Jessica and Matt that I'd love a box appropriate for all occasions and let them run with it. I loved what they came up with so much that we made no edits whatsoever! BPC: Outside of Beer Greetings, what do you do on your day to day? Any other business ventures/artistic projects/etc.? Too much! Ha. Seriously, I get excited by so many things and tend to jump in right away. Like I mentioned, my company Smartsy Brands has several brands that I run, including Lilywrap gift wrap, Beer Greetings, Cheer Greetings, and the Vortex. We also have a real estate business renting out properties on the coast. I'm also very involved in the community at our girls' schools, at church, leading a girl scout troop and with the Atlanta Ronald McDonald House charities. In between all of that, I love to travel, watch football, picnic and just enjoy the small pleasures in day-to-day life. BPC: BPC believes in the importance of a handwritten note and sending snail mail -- what are your thoughts on this? I think there is no better way to show love and appreciation than through a handwritten note. I have three young daughters (5, 3 and 1) who LOVE creating cards, mailing them to family and leaving me sweet notes and pictures around the house. (My Kindergartner recently made the cutest postcard to reply to her grandparents who were on a long trip!) If I ever forget the importance of expressing sentiments in this way - I need to look no further than the effect the little notes floating around my house make me feel. BPC: What's your favorite part about running a business like Beer Greetings, and what's the hardest part about running a small business? My favorite part of running Beer Greetings is all of the amazing people I am able to meet - through social media, collaborations, my retailers, trade shows, and more. I have met the most interesting people. The hardest part of running a small business is running into issues like production delays and bad product that are beyond your control. These issues, unfortunately, happen - but I hate seeing progress stall and customers disappointed. BPC: What's your favorite BPC card? My all-time favorite is probably "Y'all Are Gonna Make Pretty Babies" - makes me laugh every time. Posted on October 19, 2018 by matthew berinato and tagged beer greetings breathless paper co paper goods craft paper craft paper goods artists atlanta artists local business shop local shop small small business southeast nashville tennessee georgia breathless family business interview craft beer beer gifts gift ideas holiday gift ideas. Fall is HERE! 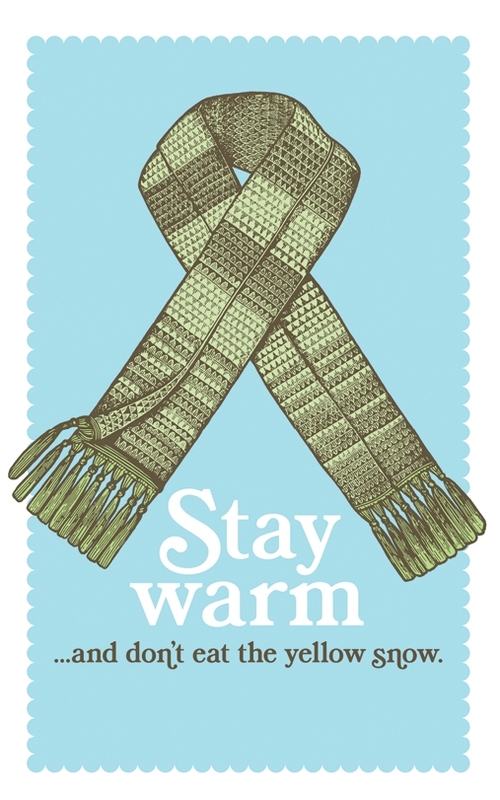 We’re so excited for it to finally cool down, and for things to get cozy. That being said, this month’s Card of the Month was an easy choice. Our Climb Every Mountain card from our Heartward collection represents an awesome part of fall: being outside. To order this card or more from our Heartward collection, reach out to us! Posted on October 1, 2018 by matthew berinato and tagged card of the month breathless paper co breathless paper breathless october fall autumn stationery cards greeting cards paper goods craft paper goods small business shop small shop local local business nashville tennesee family business. One of our newest lines is a collaboration with Cash Color — a project by Caitlin Shirock, a lifelong artist and designer. Having the artist’s touch on our cards has been amazing and we loved hearing about Caitlin’s path to starting Cash Color. Read on and check out the line! Click here to order. Breathless Paper Co: How long have you been an artist? Caitlin: Since I can remember! My mom always tells this story about how I would comment on the colors of the leaves during fall time and how beautiful they were and she just knew someday I would do something creative. C: I’ve always loved creating beautiful things. I studied fine art and then design, and went on to work in the apparel industry for a few years designing t-shirt graphics for Abercrombie & Fitch. That job was the perfect mix of graphic design and art because we did a lot of work with different typefaces which I loved and then we would also paint beach scenes and sailboats which I also loved. It was there that I fell in love with the medium, Gouache. I had never used it before but now it’s what I create 90% of my work with. I then moved to Nashville (and shortly after married my high school best bud/crush) and started freelancing here doing everything from logos, branding and identity to custom illustrated invitations for brides and other events. I launched Cash Color last year when I realized how badly I needed to really focus in on one thing rather than trying to master them all. So thats when I started to put the time into really thinking about what I love to paint most and how I can create a brand around that. It has always been this far fetched dream to run my own business and sell my own happy, bright, fun artwork. Although extremely challenging at times, I just love learning the ins and outs of running a small biz and being the artist behind it all. It makes me so happy knowing my artwork sits in peoples beloved homes and hopefully brings them joy every single day when they look at it. I have dreams to grow into putting the art on fabrics, wallpapers, and continuing to do more fine art in the years to come! C: I met Jessica at a WeWork event, I loved her cards and introduced myself — little did I know we would soon work together and partner up! She is such a sincere person and I could just tell that from the first minute of speaking with her. We later did a pop up together and got to connect even more, exchange information, supported one another and made a coffee date! I was so excited to get to know her story and how she established her amazing brand of over 10 years. I’m so impressed by BPC, her office is adorable, her kids of course are too, and I just love how she collabs with so many different brands and creates fun products. She gets stuff done. I totally look up to her and feel blessed to have crossed paths with her. C: The art is taken from my Neutral Abstract Letter Art collection. Her husband does Graphic Design and I have that in me too, so I think that’s what caught their attention to the line… It’s a very well balanced, yet artful collection of all 26 letters painting in an abstract way. I grew up surrounded by monograms and have always wanted to make them more funky! This is my interpretation of that. BPC: If you weren't an artist, what would you be doing? C: I’ve honestly never really given this much thought because being an artist was just always my passion... I have always said I wanted to be an interior designer, but instead of put rooms together I get to work with designers who style my art in their gorgeous homes and rooms — so thats even more fun for me! I am a really good organizer, it comes naturally and I oddly enjoy it, so sometimes I think I should be going into homes and reorganizing peoples spaces! C: I am a huge advocate of this. I have in the past created personal stationery and I absolutely believe in the power of a handwritten letter. I have one in particular that has changed my life. It’s from my (now) husband and it is probably my top 5 most favorite things I own — a piece of paper with words that he took the time to thoughtfully write to me, from his heart and then mail it out! Changed my life and I hold it so dear. I love the feeling of writing a card, putting it in the mail, and sending it off to make someones day. Something so magical about it and it really works. C: I love working with women that just love decorating their homes and have fun with it. It is so so fun and I feel honored every time I can help bring brightness and joy into their homes by adding art to make their house a home. What's your favorite BPC card in the Cash Color line? What's your favorite BPC card not in the line? I honestly love the “L” haha, I don’t know why but there is something so soothing about it and my eye just loves it! A lot of people buy they letter art just for abstract art or for the color, so I hang the L in my home for that reason, that and to me, it stands for Love. In the BPC lines: I love the Heartward collection and specifically the “Grow through what you Go through”. Need I explain? It’s so good and so true and a good reminder everyday! But they’re all so good!! Posted on September 28, 2018 by matthew berinato and tagged cash color illustrations design designer illustrator nashville hilton head hilton head island tennessee south carolina carolinas low country paper goods paper company breathless breathless paper co craft paper craft paper goods stationery greeting cards.